The north of Thailand differs from the rest of the country in geography, culture and climate. This diversity has drawn visitors from around the world since the early seventies. The area is littered with sites reflecting the history and unique culture of the region. The cooler climate makes for an ideal trekking holidays with Chiang Mai the popular starting point for people heading to the densely wooded mountainous province. Other starting points include Pai, Umphang, Soppong and Nan. The area is home to a large number of ethnic minorities who have their own language, culture and clothing. Northern Thailand has a wealth of national parks offering nature lovers a huge choice of destinations. 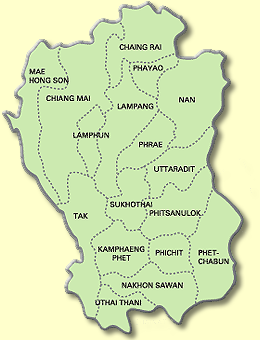 There are six parks in Nan province alone. To cater for the increase in tourism many activities have sprung up including rock climbing, white water rafting, yoga and elephant riding to name but a few. The northern cities have a great deal of culture and rich heritage as the many ruins and temples can testify. For those who wish to learn more, Chiang Mai is well known for its language and cooking courses. 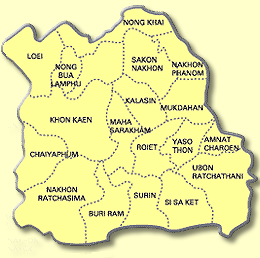 Northern Thailand has many travelers heading for neighbouring Laos via the crossing town of Chaing Khong. The main attraction of the north is nature. Swim in waterfalls, go jungle trekking, enjoy incredible views and taste the distinctive local cuisine. Although the main big ticket destinations may have become well touristed, for every popular attraction there are six more that nobody knows about. It’s up to you to find them so take your explorers hat with you. A day won’t pass without you seeing or experiencing something new. Also known as Isan, the northeast region of Thailand is often overlooked by travelers -- many of whom seem to write it off as boring, dusty and flat. They couldn't be more off-the-mark. Isan is a traditional yet wildly colourful and interesting region which is well worth allowing some time to explore. Although North East Thailand may not have the pristine beaches or hill tribe trekking that so many tourists yearn, the appeal is more subtle. As with the entire country, the people are very friendly and the food in particular is terrific, but there is something more elusive to that draws visitors back again and again. The Mekong River is dotted with towns with scenic river frontages, exotic eating and a wonderfully relaxed feel to them. The provincial towns of Mukdahan, Nakhon Phanom and Nong Khai are all worth a visit in their own right. For a slower (though hotter) way of life That Phanom and Sangkhom offer the chance to experience the authentic Thai way of life. Those interested in the countrys past, Khmer ruins are dotted all over the south of the region with Buriram and Nakhon Ratchasima being good places to use as bases to explore the area.